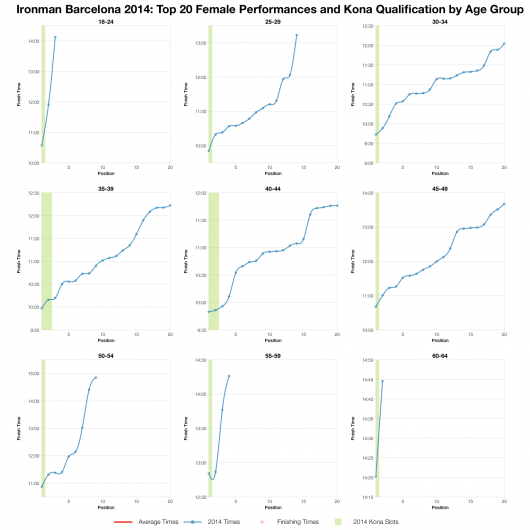 Sunday saw the inaugural Ironman Barcelona take place – inaugural in brand name only, in previous years Barcelona has been a successful Challenge event. Known as a fast course (conditions allowing), this year’s rebranded race did not disappoint with fast times across the disciplines. 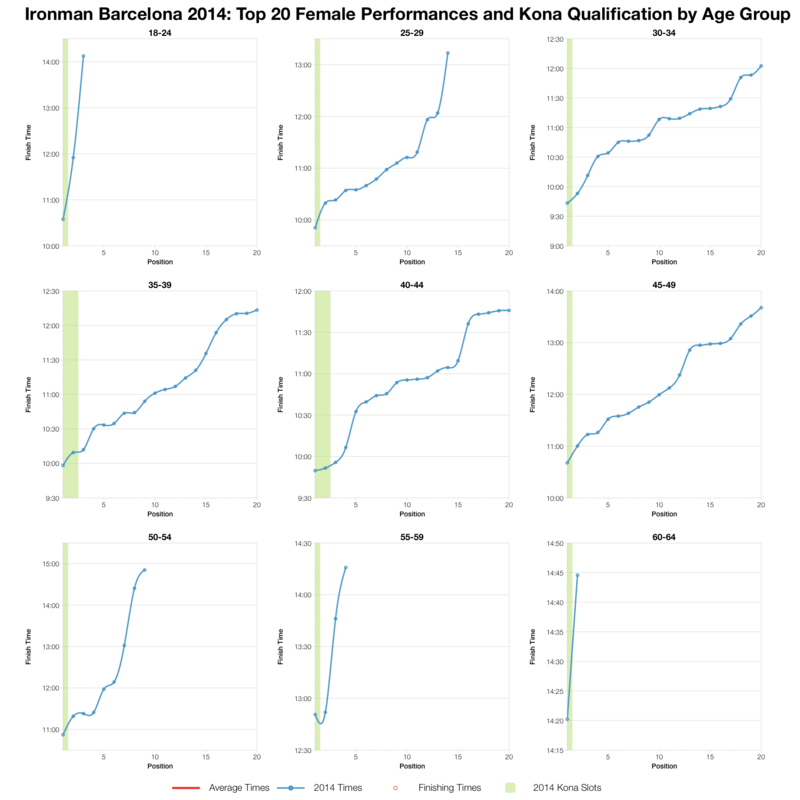 Previous results are available, but in PDF format limiting accessibility, so for this analysis I’ll compare the results from Barcelona against other European Ironman races. Starting at the top level with median splits across age groups, Barcelona compares favourably with the aggregated averages from 2013 European races. 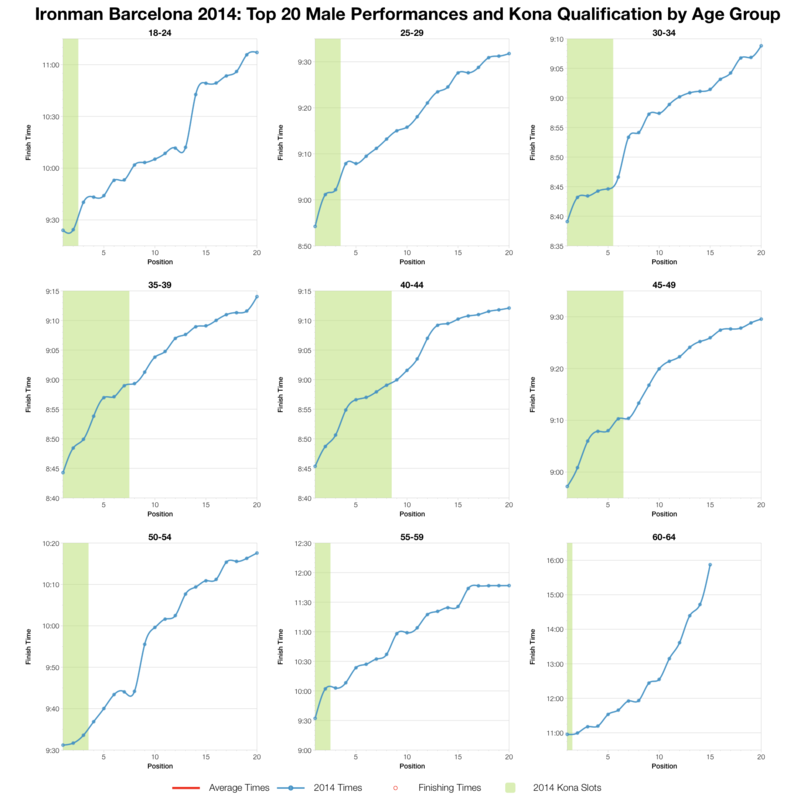 Differences in swim times are insignificant, Barcelona seems much like other Ironman races in this regard (unlike most it had a wave start). 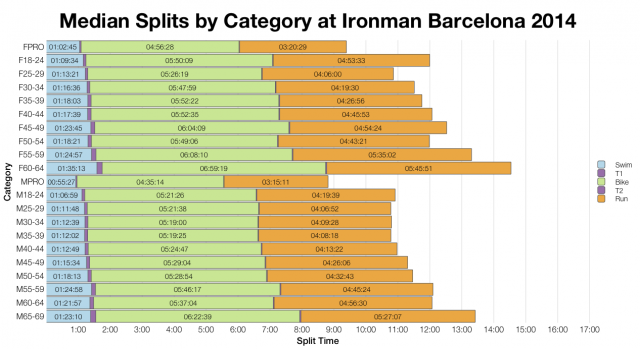 Run times are slightly faster in Barcelona, but not by a huge margin. It’s the bike where the biggest differences are found with Barcelona splits notably faster than the European aggregate. As I often do with faster races I’ve also included the Frankfurt results for comparison, again the Barcelona bike splits come up faster than the typical German results. Switching to split distributions offers the same result. Little variation in swim, a touch more in the run and a huge shift on the bike. 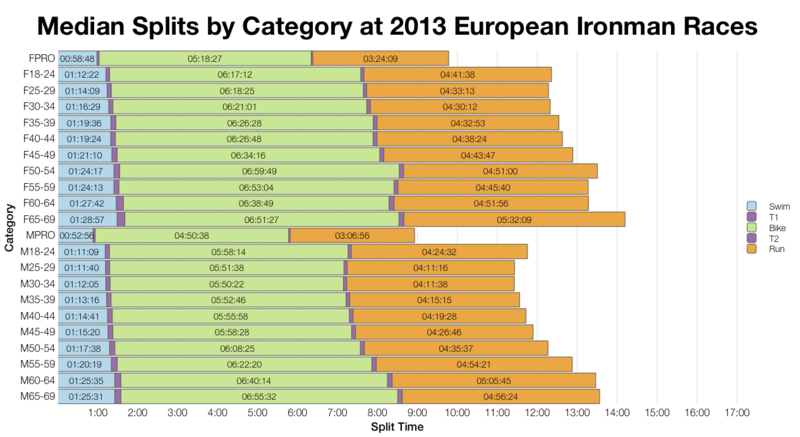 Over 50% of the field finished the bike in under 5:30, half an hour faster than is typical in the European data. 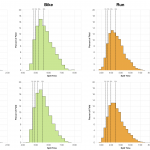 The results compare more closely with the Frankfurt data, even then the 50% mark on the bike is 15 minutes faster in Barcelona. 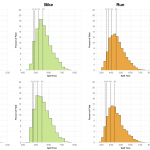 Unsurprisingly with splits at the faster end of the spectrum, particularly bike splits, the overall results also trend faster than most races. Barcelona is a fast course and it looks likely conditions favoured the race on Sunday. Clearly a good choice for setting an Ironman PB. 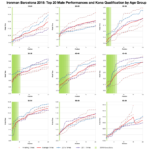 As I didn’t do it in advance of the race, the above table contains my estimates of the Kona slot allocation. Actual figures may vary depending on start numbers on race day. It’s the M40-44 weighted distribution we should be used to seeing now. The front of the pack was as fast as the rest of the field. In the men’s race every age group winner between 25 and 50 went comfortable sub-9 and the top twenty between 30 and 45 were all under 9:15. 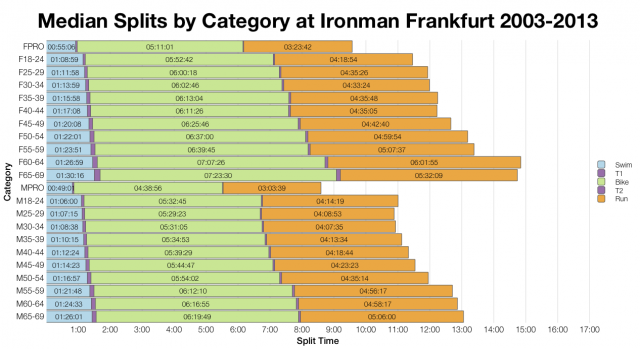 Some very fast times for the front of a race, again easily comparable with Frankfurt. A few exceptional athletes take the very front slots, but even after fifth place the drop off in times is minimal. 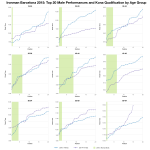 The much smaller women’s field led to a broader set of results in the top twenty (often accounting for half the field in an age group) with the very front of the race still posting some exceptional age group times. A fast course and fast conditions made for a great PB Ironman at the weekend; it looks like a couple of my athletes have finished their season well in this regard. On the other hand, for those hunting Kona slots the competition and times at the very front of the race were fierce and with only fifty available this may not be the best choice. As usual a spreadsheet of the full results and splits from Ironman Barcelona 2014 are available on my Google Drive.